Welcome to the final 1% - the Venus elite. Venus Final Phase unlocks the secrets of taking your training and nutrition to the next level with information gathered from science, research and years of Venus community success stories. It's the ultimate Venus lifestyle resource for women who aren't prepared to leave any stone unturned. John Barban's 12-week training and nutrition plan allows you to dig deep and uncover your potential. Get access to two exclusive pyramid training routines and Venus supersets which can be combined with your other Venus workouts and done at home or in the gym. 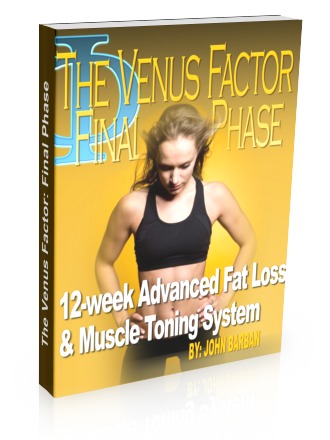 Make no mistake, Venus Final Phase's advanced fat-loss and muscle toning techniques aren't for everyone. Venus Factor Final Phase is only for women who want to close the gap and achieve their ultimate physique. Discover insider tips to lose those final inches, develop your personal eat-up day pattern and blast through plateaus. Some women are surprised at the secrets we reveal here. It's the kind of stuff you'll use for life. Are you ready to make the commitment?